New York, USA - The owners of a Brighton home decided to rebuild, but before they did ReHouse Architectural Salvage were asked to salvage what they could. 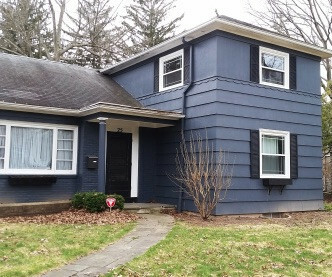 Julie from the Rehouse team tells the story and shows how many great pieces could be saved for reuse from a 1960s home. 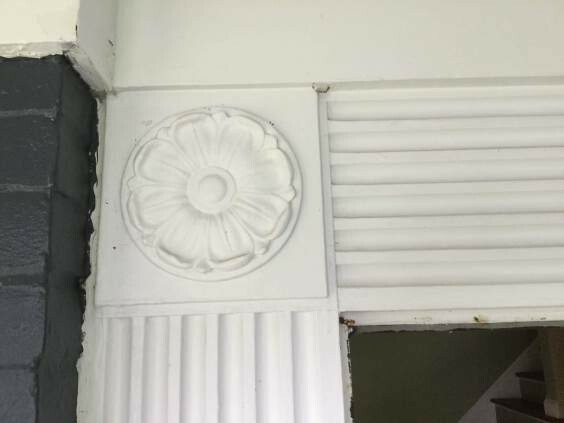 The rosettes in the corners of the front door frame really have roses on them. We were able to get them out beautifully. These are 9.5″ square and $23 each. Outdoor lights in the front and rear of the home. 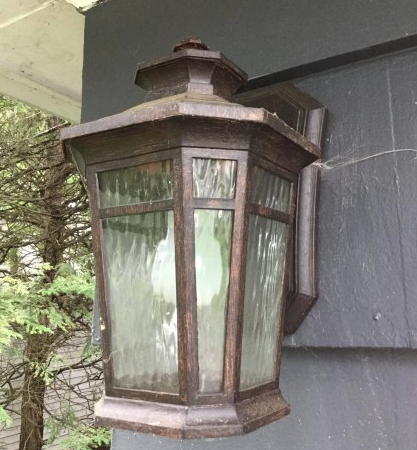 These sturdy wrought iron carriage lantern style lights are in two sizes. 7x13x8 (quantity one, $40) or 9x18x12 (quantity two, $80 each). Double sliding patio doors with full windows on each side. The frame for this is one very big piece. 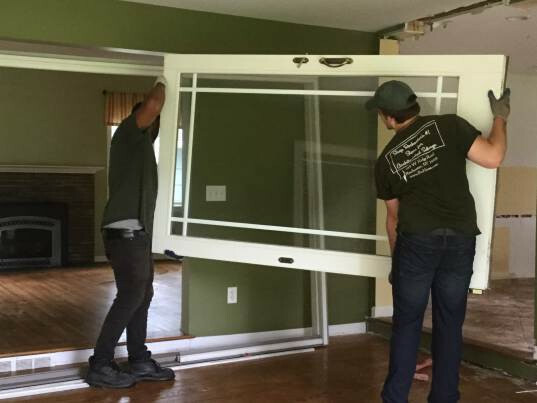 The 2 doors and 2 windows all fit in the one frame. It is about 16 feet long and about 7 feet high. Darius and Jacob carry them out to the truck one at a time where David is waiting to help load and stow them carefully. 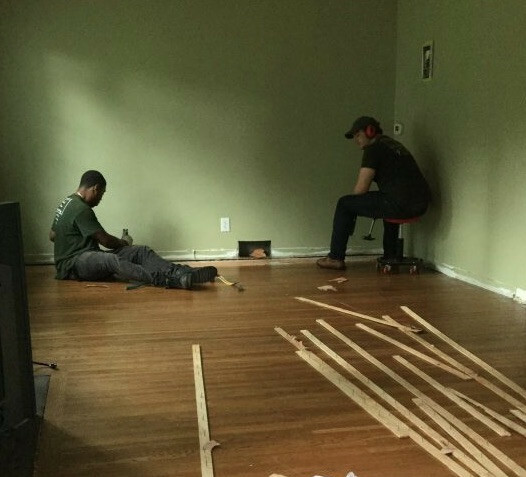 Throughout the house there is nice top nail hardwoods. We salvaged as much as we had time to remove and load. Soon it will be denailed, measured, bundled, and priced at $2.25 per square foot. The small mud room had built in cubbies and coat racks for easy storage of coats, boots, gardening supplies, dog leashes, and more. I could not fit in the mud room to take photos of the deconstruction. This piece has not been put back together yet, but let us know if you are interested in it. It measures approximately 95.75w x 95h. It could be shorter if you did not use the toe kick or the top molding. Each of the two bathrooms had stylish, next-to-new vanities. The first is dark grey with 4 drawers and one center door, all with chrome knobs, Moen faucet, Quartz top with under-mount white ceramic sink, and matching backsplashes on rear and right side. 43x36x22. $395. 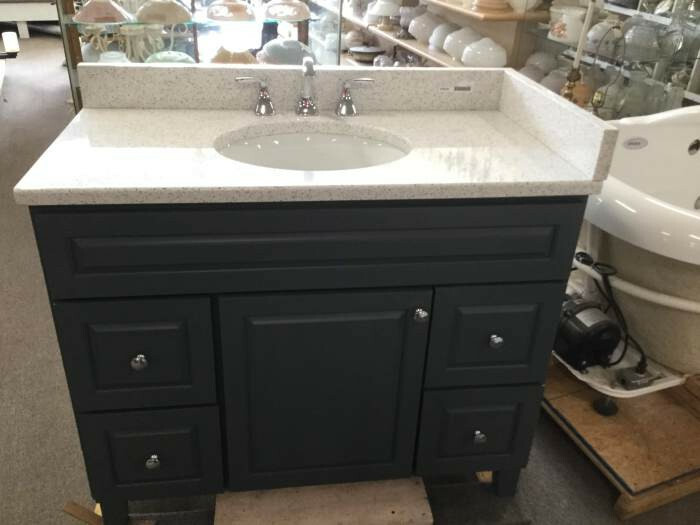 The second bathroom vanity is dark coffee color, four drawers with glass knobs, one lower shelf, and tan stone like top with white under-mount sink and brushed nickel faucet. 36x34x21. $355. The homeowners saved the beautiful kitchen cabinets and appliances for their new home. It was good to see that everything in the kitchen was being reused. However there were a few more interior spaces: cubbies, built-ins, cedar closets, hardware salvaging. Plus a dark creepy basement, with no electricity, filled with lots of shelves for all your preserves. It also felt strange to be in a house with no actual windows. There has been a growing trend for renovation projects and tear downs of newer houses built from the Thirties onwards so it is good to see as much salvaged and reused as possible.